The patented Free-Up Feeder is great for stall hay feeding and swings open to fill in less than 30 seconds! The metal Free-Up Feeder Frame measures 12" x 24" and features safe, rounded corners, plus a threaded locking nut. Open the nut to weave your Cinch Net onto the frame. Once the net is on the frame, turn the nut to close for additional safety and overall structural strength. Ideal for: Large stables and streamlining chores. Use in stalls, trailers, lean-tos, turn outs, panels, fences or on barn walls. Works indoors or outdoors! The Original (1 3/4") HEAVY DUTY opening size is good for more aggressive eaters and a larger herd. Also good for horses that haven't used a slow feed net before. 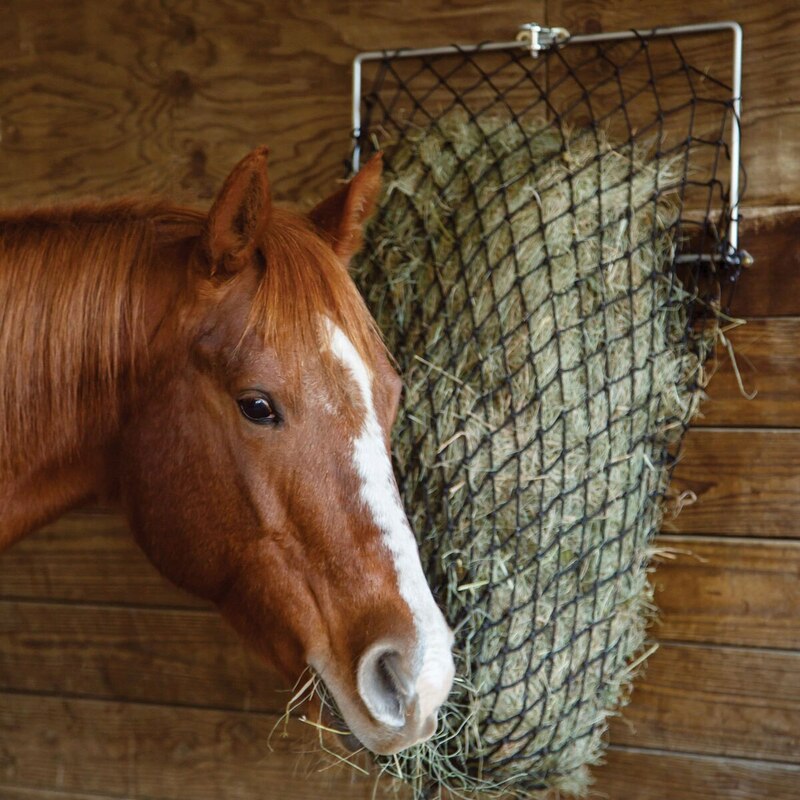 It's great for slowing down horses that eat fast, are generally healthy, but waste too much hay. The SF/Slow Feed (1 1/4") opening size is good for horses that doen't get enough exercise or are metabolic. Very easy keepers who have used slow feed nets before do well on this net level. Also works well as a pacifier for stall-bound horses. 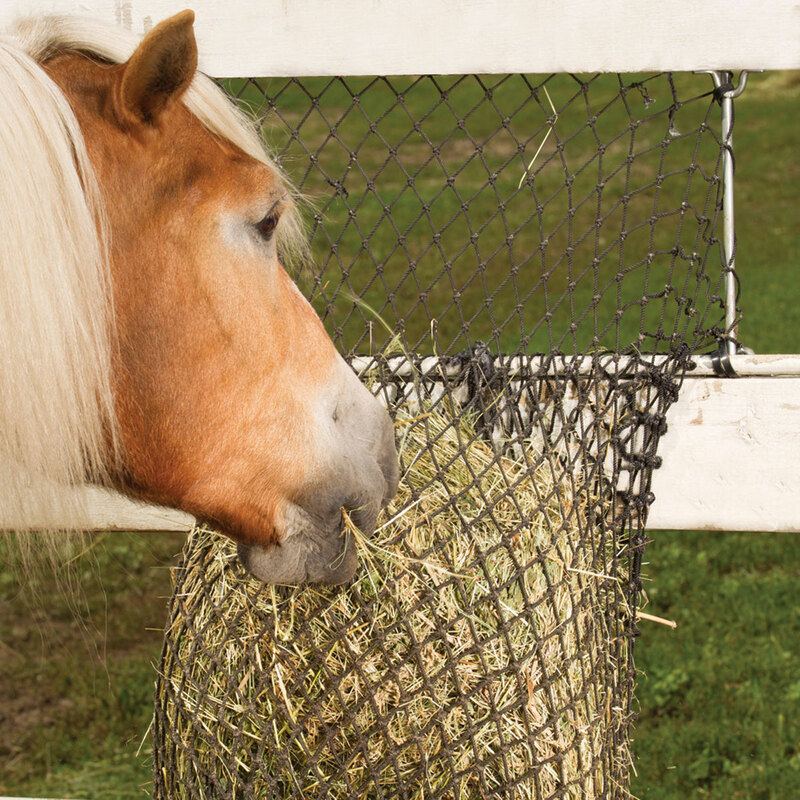 The Hay Chix® Cinch Net Mini size 1 3/4"- Heavy Duty can serve as a replacement net. Easy to fill in less than 30 seconds! Metal Frame - 12" x 24"
Hole sizes - 1 3/4" or 1 1/4"
The Horze Hay Weight is the perfect scale to weigh hay. Small and handy tool to have around your barn to help you weigh out the perfect amount of hay for your horse. Eliminate the guessing game! Keep your barn organized! Many options ensure that you will find the whiteboard to fit your needs. A variety of erasable marker/tack boards to choose from. Approximately 24" x 36". Please allow 8 weeks for delivery. The SmartPak Storage Drawer is the perfect solution to storing your horse's monthly supply of SmartPaks! (SmartPaks not included). 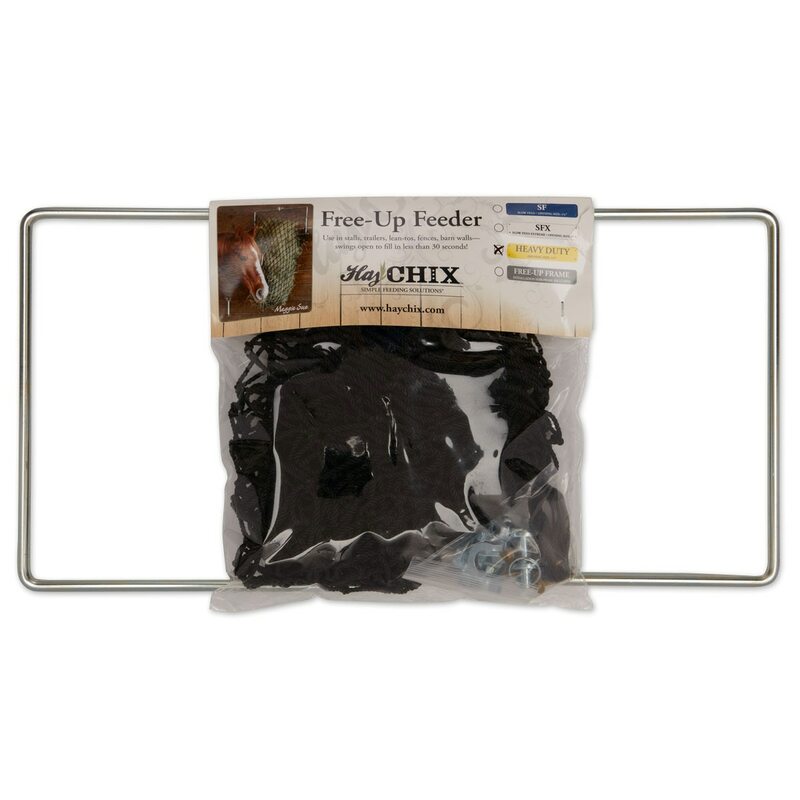 Hay Chix® Free-Up Feeder is rated 4.7 out of 5 by 7. Rated 5 out of 5 by Karen from SOOO easy to load Takes no time or effort to load. I have been using Nibble Net brand and this one feeds slower than their smallest opening net. Rated 5 out of 5 by Debbie from Awesome hay bag This is very nice and easy to use. Love it! I would definitely recommend this and it’s worth the price. Rated 5 out of 5 by DebF from Free-Up Feeder by Hay Chix At the Equine Affaire in MA this past fall I bought 2 of these feeders, recently I bought two more from Smartpak. ABSOLUTELY love them. I put them outside in my run in shed for 4 of my arab endurance horses and they are just perfect esp. for second cut hay. No waste whatsoever and the horses have more eat time...cannot say enough about these. I have also bought several of their hay bags. Hay Chix woman are super cool!!!! Rated 4 out of 5 by AnnC from does it's job This net is pretty easy once you figure out how to get the bar to lock and the hay net out of the way ... I have fed in hanging nets for 11 years , this year my neck has been bothering me . Go figure hanging a 10-15 pound hay net over my head to hook it .. this is very easy to stuff and slows down my chow hound mare .. Rated 5 out of 5 by Jmkos from Love it Genius product! I board at a large facility and my groom loves this. Easy to refill, keeps my one horse from stepping on good hay and ruining it and then not eating it. Stall clean up is way easier and faster too. Haynet is filled for the evening with a couple flakes on the ground underneath. Horses are out all day. When they come in for evening, they eat flakes first and then have the nets to work on the rest of the nite. Works out great!